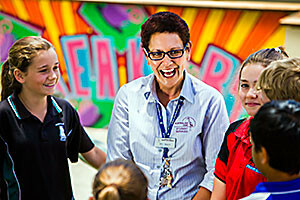 Our qualified Student Support Officers each take responsibility for a year group. The Student Support Officer role is key to the provision of high quality student health, welfare and support at Australind Senior High School ensuring that all students’ safety and well-being is maintained. The Student Support Officer will work closely with the pastoral team and external agencies developing, implementing and monitoring systems and procedures to improve student welfare. Develop and maintain positive relationships with their Year Group of programmes relating to school policy – i.e. bullying. Address staff concerns in relation to student health, wellbeing and attendance. Help organise case conferences for specific students. Refer students to school psychologist, school nurse, and external agencies. Monitor student attendance as required and liaise with parents regarding attendance issues.